10 November, 2010 Dargaville's award-winning Circus Kumarani is on the lookout for a community circus trainer. The group teaches circus skills to people of all ages and abilities, supporting individual learning, boosting confidence and breaking down barriers between groups. Northland manager Jenny Huriwai says the circus has been relying on employing international trainers, “but they can only stay with us so long”. Circus Kumarani began in 2003 with a show involving members from two disability providers and local school children. Two hundred people now attend classes each week at the Dargaville circus and creative centre. As many as one in five have a disability. Classes vary in size, with up to 70 attending community sessions. 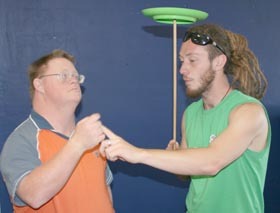 Four groups of disabled adults attend classes weekly, as well as children, youth and community members. The circus looks for opportunities to bring the different groups together for open stage nights, special workshops, rehearsals and shows. “We have a small group of committed volunteers that give generously of their time and energy, and our contracted staff all go the extra mile,” Jenny says. She said the group appreciates any assistance it gets and welcomes anyone interested in becoming a member. Jenny realises finding a circus trainer will not be easy, because many of those who train in circus arts in New Zealand head overseas to get experience. Original generation time 1.3267 seconds. Cache Loaded in: 0.0004 seconds.